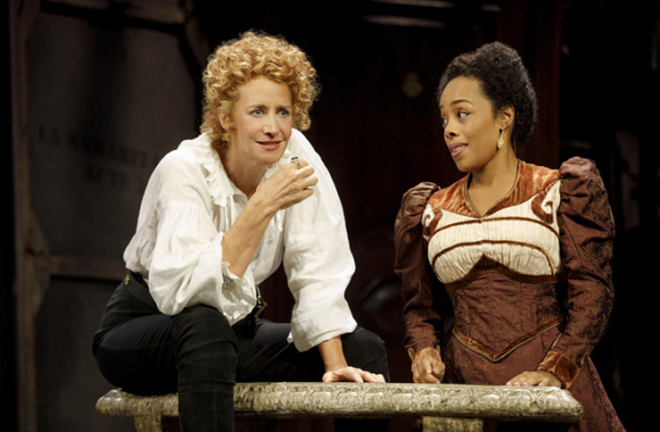 Janet McTeer and Brittany Bradford. Photo by Joan Marcus. You can't take your eyes off her, Janet McTeer playing Sarah Bernhardt ("La Divine Sarah"), the charismatic French actress of the late 19th century. In playwright Theresa Rebeck's fact-based Bernhardt/Hamlet, McTeer, commanding in high black boots and tights, brings out the intense fierceness and sensuality of one of the primary divas in theater history. At the same time, McTeer reveals the undercurrent of bittersweet as Bernhardt is forced to face hard-set traditions, biases and the dark years of aging before her. Rebeck's play takes place in 1899, the renown Bernhardt is in her fifties, managing her own theater and she now insists on playing the leading role in Hamlet. It is the challenge of her career, indeed of her life. Hamlet is an enigmatic character and although she secretly harbors a fear of Shakespeare's poetic language, Bernhardt is confident she can conquer the role. She sees no problem playing a man, even a younger man, insisting Hamlet is 19 years old, not 30 as many, including her married love interest, Edmond Rostand (Jason Butler Harnar), claims. Beowulf Boritt’s revolving set showing a bare theater stage, a dressing room, and backstage where Bernhardt rules in lush costumes designed by Toni-Leslie James, an egocentric talent battling a society empowered by men, despite the rampant misogyny. She is accustomed to battles and McTeer reflects Bernhardt's complexity, her joy when she wins a theatrical round, and her apprehension of maintaining a career of highs and lows. Under Moritz von Stuelpnagel's taut direction, who could not believe McTeer as the grand diva of French theater? An entourage gathers at her feet her dressing room and toss confetti of accolades, all appreciating her mind and charm. These hovering men include noted critic, cynical Louis (Tony Carlin) . In a stalwart performance, Dylan Baker plays actor, Constant Coquelin, also questioning the wisdom of her project. Artist, Alfonse Mucha (Matthew Saldivar), assigned to paint a new poster of Bernhardt, has problems getting the project to everyone's liking, especially his own. Maurice (Nick Westrate), Bernhardt's grown son, shows up unexpectedly and is astounded about his mother's latest plans and worries about her dwindling funds. Despite quibbling, the two show a loving relationship. Edmond Rostand is more interested in his own work-in-progress, Cyrano de Bergerac, than in rewriting Hamlet for Bernhardt's needs. Harnar's Rostand is lusty and fascinated by Bernhardt but he has a wife and family competing with any theatrical intrigues. It is, in fact, his wife, Rosamund (Ito Aghayere) who takes matters in her own hand and brusquely brings things to a close. Brittany Bradford as Lysette is a supportive as a fellow actor. Rebeck's book is wordy and wavers, playing light and loose with facts, yet the playwright offers Janet McTeer a chance to showcase a theatrical legend who was known to make up her mind and make the world believe. As biographer Lytton Strachey noted, "(Bernhardt) could contrive thrill after thrill, she could seize and tear the nerves of her audience…. Above all, she could ply her personality to the utmost." Brilliantly, Janet McTeer exhibits this extravagant personality at this one point in her life. Running time: Two hour, 25 min. One intermission.